Title: 'L' Empire des Turcs'. From the "Atlas Nouveau Portatif". Published by George Le Rouge. Paris: 1748. 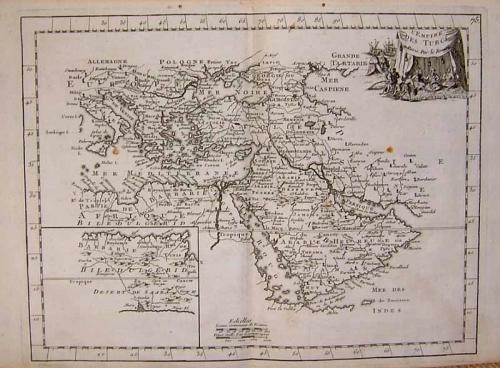 An elegant map of the Turkish Empire with an inset of the North African regions. George Le Rouge had a long and productive career as Engineer for the King of France and a publisher from 1740-1780. This map is typical of French cartography of this date, with the attractive details provided. In very good condition on clean paper, with only a small spot in the image (visible in the photograph).